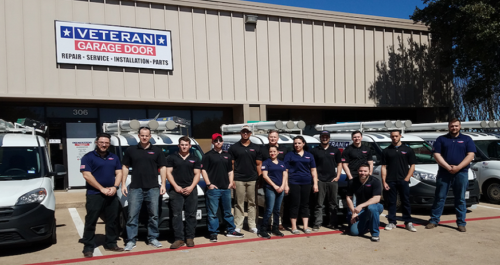 At Veteran, our door is always open, especially for our customers in Weatherford TX. Even though our doors are made of the best quality materials and will last for ages, whatever the weather, and it doesn’t matter whether you’ve got a classic white Veteran door from our Classic Collection or a Desert-Tan Roll-Up, there’s going to come a time when the door needs repair. That’s where we come in. Our field technicians cover the entire area of Weatherford TX to provide same day local and emergency service for your garage door repair. You can call us on our service free line: 972-347-0724, or drop us a line online. We value our customers in Weatherford, TX., and for every garage door repair that you need, Veteran has the parts and a professional and capable team of field technicians to come and fix it. If it’s just a broken spring replacement, if the roller needs replacing or even if your smartphone connection needs tweaking, we’ll be there to do the job. Regular maintenance will improve the quality of life for all your home appliances, and it is no exception when it comes to garage door repair in Weatherford. For instance, we highly recommend replacing the end bearing plates after a while, because these end bearings constantly support the weight of the spring in the garage door. And even though our garage door tracks are galvanized against corrosion and rust, we suggest checking them, now and again, to enable the proper operation of your garage door. In addition to garage door repair in Weatherford, TX, Veteran offers a wide collection of brand new garage doors for our valued customers. The elegant garage doors in our Classic Collection have a 2 layer insulated or 1 layer non insulated feature. Also, take a look at our garage vintage look online. We offer handcrafted wood doors in our Wood Door’s Collection. We apologize beforehand, but your neighbors will be knocking on your door, because they’ll want what you’ve got too! When you know that we will be at your door in Weatherford, in rain and in shine, you can relax and enjoy your day, and if you get stuck, we’ll be there to repair.